Video converting is a computationally intensive process which takes long time. Particularly, processing a giant, high-resolution video can be a real struggle. Just like a user cried on VideoHelp forum, "Handbrake just told me that it would take 25 hours to encode a 2 hours and 20 minutes movie to H.265. That's ridiculous". It is far from acceptable, but it's happening. If you have to process an enormous amount of videos, imagine how painful it would be! But, if you have a Geforce GTX 600 series or higher graphics card installed on your computer, you don't have to suffer. A good Nvidia video converter in 2019 will efficiently exploit the extra computational resources of GPU to drive video encoding and decoding significantly faster. 4. High quality engine and Auto Copy ensure 98% original quality. Check if You can Enable Nvidia Transcoding? First of all, please be aware that not all the video converting can be accelerated by an Nvidia GPU video converter. The converting video formats that a GPU accelerated video converter can handle are limited to NVIDIA GPU acceleration's support for specific video codecs. So check if the video codec is supported by Nvidia's Cuda/Nvenc hardware acceleration tech. As long as your computer is equipped with the new Nvidia GPU chips, and the codec limitations are satisfied, there is one another tools required- a NVIDIA cuda video converter for 2019 that can utilize the power of Nvidia processors. Since we are talking about speeding up converting HD and UHD videos, why not start with the fastest Nvidia video processing tool- MacX Video Converter Pro. The only Nvidia video encoder in 2019 that supports not only Nvidia Cuda/Nvenc, but also Intel Quick Sync Video and AMD GPU hardware accelerations. Together with advanced Hyper-Threading and Multi-Core tech, the converter delivers a 5 to 8x faster processing speed based on the computer config & video codecs. It significantly cut the processing time for large and UHD files (with a speed up to 250fps). It's the only GPU accelerated video converter in 2019 that is able to apply the Level 3 Hardware Accelerations - namely use GPU to do the decoding, processing and encoding. It's the world's first software that reaches this level and accelerates the whole video transcoding except the demux & remux. Therefore, it's the fastest video converter with Nvidia Cuda/Nvenc support. It supports videos of any resolutions from SD, HD to 4K & 8K ultra HD, and any formats covering HEVC, H.265, H.264, MP4, AVI, MKV and more. The High-Quality Engine ensures the top-quality results converting any high-resolution files. Plus, flexible video editing features available. Compress large 4K videos to 40% to 70% smaller size, upscale HD 1080P videos to 4K, edit videos to further customize the outputs, merge videos, etc. How to Use an Nvidia GPU Video Converter? Free download the NVIDIA GPU accelerated video converter on computer. Step 1: First, run the converter and click the Add button on the interface to load the source video. Or drag and drop the video to the software. The converter will do the demux in the background and prepare for Nvidia hardware converting. Step 2: Then select an output format from the popup window. As Nvidia GPU supports several H.264 & H.265 hardware encoding only, you can select any format with these codecs (like HEVC, MKV, MP4, MOV etc.). 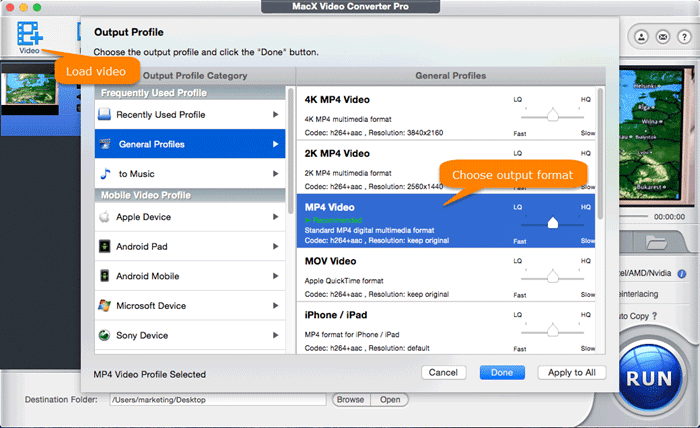 Also you can choose to convert videos to iPhone, iPad, Samsung devices (with H.264 or H.265 codecs) directly. Make sure you have checked the Nvidia hardware accelerator box on the interface to let the converter enable Nvidia Cuda/Nvenc GPU hardware acceleration if available. Step 3: Click to adjust the video parameters like changing the frame rate from 60fps to 30fps, or you can just leave them at their defualts. Click the button to do any edit like trimming, merging, subtitles editing etc. Step 4: Now click Run and the Nvidia Cuda video converter will utilize the GPU hardware to do the transcoding. After that, it simply muxes the transcoded data into the video format. All the process will be done background. The GPU hardware converting will be finished in minutes and the software will notify you soon. Support Nvidia Cuda/NVENC/NVDEC, Intel QSV and AMD hardware accelerations, the 2019's best GPU accelerated video converter delivers the fastest speed (5-8x faster) processing 4K Ultra HD HEVC H.265, 1080p/720P H.264 etc. with top quality. GPU Encoding or CPU Encoding, What's the Difference? Learn how to enable Handbrake GPU hardware encoding. Which is faster? Do you really know the difference? How does Intel QSV speed up video processing?